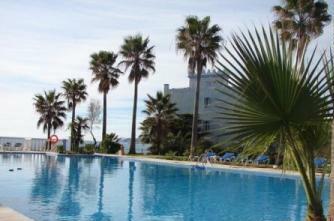 Situated on the beach at Casares between Estepona and Sotogrande on the Costa del Sol in Spain. La Perla is a fantastic complex of Moorish apartments and villas by award-winning international developers, La Perla. We are proud to present our luxury 3 bedroom south-facing apartment, La Perla enjoys stunning views of the coastline and Gibraltar. Right on the beach yet only minutes away by car from the white washed "pueblo blanco" villages of Andalucia. The apartment has magnificent views from the lovely shady terrace, with three bedrooms and two bathrooms, while a beachfront cafe and pool + separate toddlers pool are only a few yards away. The large terrace has an outdoor dining table with six chairs, plus two sun loungers. There is direct lift access from the car park, as well as Satellite TV/DVD showing UK programmes, air-conditioning, underfloor heating, a jacuzzi style whirlpool bath, and master bedroom with extra wide, super king size bed. Bedrooms: Master bedroom with extra wide super king size bed.Bedroom 2 with twin beds.Bedroom 3 with twin beds. Bathrooms: Master bedroom has an en-suite bathroom with whirlpool bath, two washbasins, underfloor heating and separate shower. 2nd bathroom includes bath/shower and underfloor heating. Kitchen: Oven, hob, fridge/freezer, dishwasher, microwave, toaster, coffee maker etc. Utility Room: Utility area includes washing machine and dryer. Living Rooms: Living room with separate dining area. Includes fireplace, two large sofas plus armchair, Satellite TV showing UK programmes, DVD player, CD sound system. Other: Large terrace including dining table + six chairs, 2 sun loungers.